Sediment-laden floods on the Colorado River have historically built up bankside sandbars that provide habitat for endangered fish and plants. Dams along the river have since calmed its floods and trapped sand in their reservoirs, but managers have had some successes mimicking bar-building floods with timed water releases and sediment from downstream tributaries. 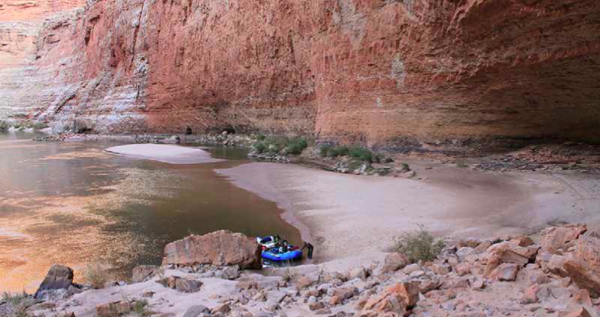 Without the managed floods from the Glen Canyon Dam, the river would never rise high enough in Glen, Marble and Grand Canyons to pick up sand and deposit it on the banks. 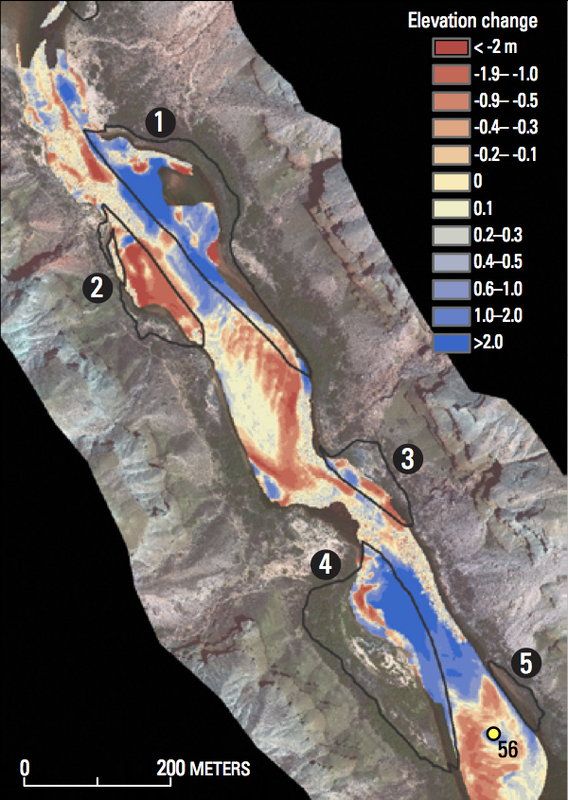 Yet the erosive power of the floods has the potential to eventually move sand all the way downstream to the next sediment trap, Lake Mead behind the Hoover Dam. That leaves scientists with an important question: Is rebuilding sandbars with periodic floods a sustainable strategy? The answer depends on whether the floods are sending more sand downstream into Lake Mead than the river is taking in through the Paria and Little Colorado Rivers and other smaller tributaries. To find out, the USGS has developed a sand monitoring program on the river. The program includes acoustic Doppler profiling instruments stationed along the river that emit sound waves into the water. The returning signal that bounces off of the sediment can be translated into the concentration and grain-size of sand in the river. The continuous, real-time data from those stations help dam managers know how much sand has entered the river. That controls when floods are scheduled, how high they’ll rise and how long they’ll last. While the real-time monitoring is essential for fine-tuning the timing and intensity the the dam releases, it doesn’t work well for long-term calculations of how the sand supply in the canyon is changing. That’s because the uncertainty in the data from the instruments–though well within reason for day-to-day measurements–compound over time. If scientists wanted to know how the supply had changed over 10 or 20 years, the data from the real-time monitoring would only be able to do so “with hundreds and hundreds of percent uncertainty,” Grams said. For data that can provide significantly more confidence, the USGS turns to detailed topographic surveys of the river bottom taken with a boat-mounted multi-beam echosounder. By comparing the elevation profiles of the same section of river cover times, scientists can see where sand is depositing and being eroded. But developing the right strategy for the topographic surveys has been tricky. The expeditions take time and money, so frequent surveys of the entire 300-mile stretch of river under investigation is out of the question. Mapping a few short sample segments is also a problem. Two relatively nearby sites on the river might have drastically different responses to the same flood, one gaining sand and the other losing it. Sample segments that are too short will miss that variability. The tradeoff the agency’s scientists have come up with is to break the river up into 30- to 50-mile segments that are mapped once a year on a rotation. The survey trips typically take from 14 to 20 days, said Grams, who recently returned from shorter trip. The canyons aren’t an unpleasant place to do fieldwork, but the environment also requires intense work for days on end.